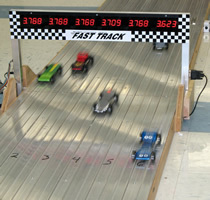 Pack 378 races its pinewood derby cars in January each year. Prizes are awarded in several catagories for design and painting, and of course the big honors are won on the track. Typically, each den races several heats to determine a den winner. At the end of the night all of the den winners race for the pack championship. Finally, there are sibling and adult divisions. The Pinewood Derby is often the highlight of a scout’s year and a great event to for extended family and close friends to attend. 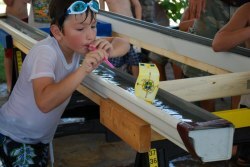 Raingutter Regatta – In the raingutter regatta, boats race down a narrow channel (10′ raingutter) in a side-by-side race. The catamaran style boat is crafted by the scout with the help of their adult partners and blown down the channel. Like the pinewood derby, boys and siblings race in multiple heats for division and overall awards. Model Rocket Launch – Another popular family-son project is the model rocket launch. Scouts provide their own model rockets that are launched one at a time from the Pack’s launching platform. Rockets soar hundreds of feet into the air until an internal parachute is deployed allowing it to safely sail back to the ground. Capture the Flag Water Balloon Toss – The scouts and their families meet in a local park for some water balloon fun. Teams work together to capture the opponent’s flag while dodging water balloons provided by the Pack. Bicycle Rodeo – The Scouts and their families meet in a local park for fun bike-related activities. Scouts, prospective scouts, and siblings participate in bike safety checks, bicycle games, and a cubmaster lead adventure. It is a great time to meet other parents in the pack and welcome new scouts. Swim Party – The pack rents a local swimming pool just before school begins as a final summer party. Scouts, prospective scouts, and their families including siblings are all welcome to attend. 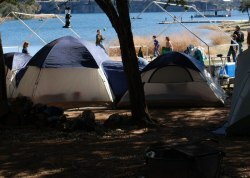 Our pack sponsors two family camping trips each year at nearby Boy Scout campgrounds. Usually held during weekends in March/April and October, the camps feature crafts, BB Gun Shooting, Archery, Campfire stories and songs, and a lot of fun cooking and eating. Other highlights of family camping include skits and songs, dutch-oven cooking, and an early morning chapel service. Most Cub Scout camping is a family event. When you attend a family camping event you may see your scout have fun shooting BB Guns, learning archery, practicing leatherwork, and learning other games, arts, and crafts. Along with your den, you’ll enjoy helping prepare a meal for the pack, and maybe performing a skit by the campfire. 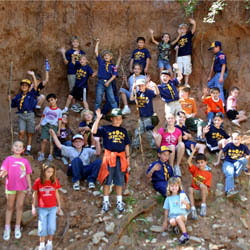 Pack 378 sponsors a number of other fun outings that promote scout development and an opportunity to be outdoors. These may include Pack hikes, bike rides, kite flying, family picnics, sporting events and untold millions of possibilities are out there for outdoor fun. These events are optional and families are always invited.